Westpac's first computer: the GE225. Photo courtesy of Westpac. GE225 operators celebrate gold anniversary. The Westpac IT team tasked with running the bank’s first computer will this weekend get together to celebrate 50 years since the bank installed the GE225 General Electric machine. 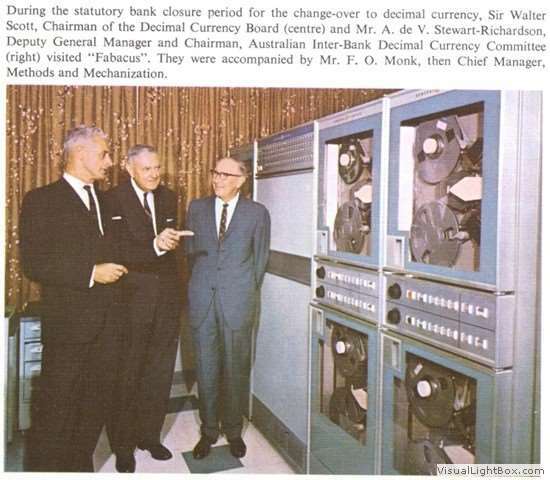 The then-Bank of New South Wales (now Westpac) held a press conference in 1964 to announce it would purchase its first-ever computer to undertake processing of cheque clearing and ledger postings in Sydney, for the sum of £1 million - about $26 million at today’s value. The bank's manager, R. J Abercrombie, at the time said the computer would help the bank contain costs and relieve workers of arbitrary tasks and refocus on assisting customers. The computer was purchased to centralise the bank’s trading accounts by replacing the machine accounting operations that were used in each individual branch. The GE225 - or the FABACUS (First Australian Bank’s Accounting Computer Used in Sydney), as it came to be known - was the size of three wardrobes and had 20 kilobytes of core memory. It was installed on Level 9 of “The Wales House” building, which is now the Radisson hotel. It was essentially a punch card operation - the programs were stored on punch cards that were fed into the computer from a reader. Data was captured by cheque readers connected to the computer which scanned the MICR (Magnetic Ink Character Recognition) encoding on the bottom of cheques, and stored the data on ½ inch reel tapes. The cheque readers also performed the function of sorting cheques in order for them to be returned to their relevant branch. The Bank of NSW began visiting each of its Sydney metropolitan branches to prepare staff for the change following the installation, and the first branch went live on the system soon after. Cheques and deposits from nearby branches were brought via exchange cars to the GE225 for processing, and the processed records were returned to each branch the same way every day. For the majority of branches, cheques were delivered and returned by mail. Additional bank systems - such as staff records and unit trust - were converted to become computerised soon after, and the workload for the GE225 quickly grew. The bank required more computer equipment to accommodate its growth, and the original computer expanded to three GE200 series machines and related equipment. The success of the system in Sydney saw the bank expand its operations to all interstate branches, and it later built additional computer centres in Melbourne, Brisbane and Perth. The team that worked on the computer were dealing with new technology and had no guidelines to follow - nor did they have any experience with technology. Ian Hoey was the man chosen to supervise the supercomputer. At 27, he was plucked from his position as the general hand at the bank’s King and George branch, and was given three female staff to manage the computer. The team eventually grew much larger, but in those early days, Hoey said it was “a bit like science fiction”, and the effort required the assistance of many outside the bank. “The machine companies were the only people that had any sort of experience. GE were a great help, the engineers that service the system and their systems people taught us a lot of tricks,” he told iTnews. “The setting up of the system was quite huge, because the cheques had to be a certain grade paper. The printing of the magnetic ink was a new thing - a lot of industries had to come together to produce the paper and encoding, not to mention the punch cards. The GE computer was eventually phased out after the bank opted to go with IBM in 1970 - a decision which compelled Hoey and his compatriots to hold a wake for the original. FABACUS was replaced by a Honeywell H-060, which ran the GE’s programs under simulation, so the bank had breathing room to convert all its systems to IBM protocols. As a result, the team formed a close bond and have kept in touch throughout the years, and will celebrate the 50th anniversary of the computer at a gala dinner tomorrow night. The FABACUS club was born in 2004 at an unrelated get-together when Hoey realised it was the 40th anniversary of the GE225. They’ve since held a 45th celebration, but this weekend’s 50th will be the last, Hoey said. Over 200 people are expected to attend the event, all of whom had some contact with the original computer.